When Americans see charts like this one which illustrate that virtually all the food on grocery store shelves basically comes from no more than 10 megacompanies, or hear statements like this one from our own Attorney General Eric Holder who told the Senate Judiciary Committee that some banks are just too big to prosecute, or check out studies like this one out of Princeton which openly declare we are not a democracy but an oligarchy … it’s kinda hard to believe we aren’t an oligarchy (because we are). 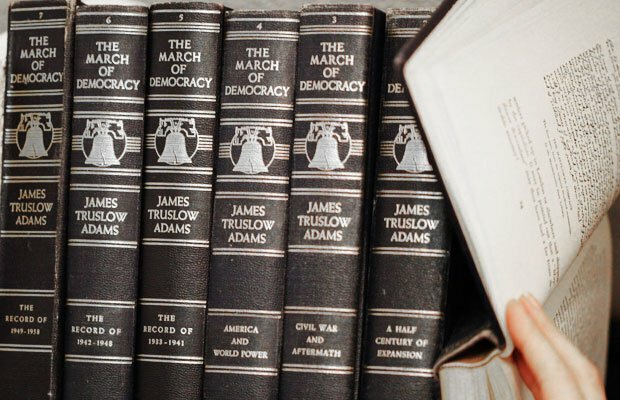 Tinkering around in an old bookstore in a small Texas town, we came across a set of old books on democracy; we got the first seven volumes of a set entitled, The March of Democracy: A History of the United States written by James Truslow Adams — the guy who coined the term “The American Dream” — for a mere $20. In fact, in volume five, The Record of 1933–1941, Adams records the death of John D. Rockefeller, Sr., as the end of the era of this great wealth — never to occur again. Despite appearances, the shift on the part of the Rockefellers and other Robber Barons of the day from outright monopoly to “philanthropic” “non-profit” charity work was not an end to the dominance by the super-rich of the early 2oth Century, but an intensification of their undue influence. The taxation of the wealthy as well as the anti-trust actions of the day, which included busting up megacorpses like Standard Oil and AT&T, were perhaps well meaning but fundamentally failed to rein in the disparity of power. 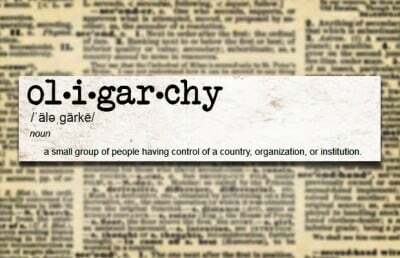 Instead, new tax laws, in reality, acted to restrict new wealth from reaching the heights of the oligarchy, allowing “the elite” to keep their own, and initiate new members as desired. The tax-free status of many institutions – including the Rockefeller Foundation, the Carnegie Endowment for International Peace and the Ford Foundation – allowed the incredibly wealthy to a) shield their fortunes from taxation, b) appear to do good works and boost public opinion of their principle members while c) influencing, writing and developing official public policy through the steering mechanisms of its own tax-free grant making, think tank and research powers. Much social engineering has taken place – with far too little public notice – through these bodies. Additionally, d) many of its directors and board members were in “respectable” positions to shift into official government positions through the revolving door without appearing to be acting on behalf of their corporate masters. The Reece Committee Hearings, conducted in 1953, attempted to probe the role of tax-free foundations in public life and uncovered many outrageous and conspiratorial actions taking place, including very apparent agendas advancing a one-world corporate-dominated government. However, it did not succeed in a general public understanding of what was taking place, nor did it rein in their powers. Yesterday, the markets in gold, silver, oil, steel and other commodities were successfully cornered by the Rothschilds and other top bankers. Under Wall Street direction, and through the powers of the then newly-created Federal Reserve, these titans were able to officially dominate nearly all the important areas of public life, including great expansions in consumer spending and government agency powers. The icons of this magnificent and terrible wealth were John D. Rockefeller, J.P. Morgan, Andrew Carnegie, E.H. Harriman, Cornelius Vanderbilt and a handful of others. Today, those icons of wealth are the likes of Bill Gates, Warren Buffett, Carlos Slim, Larry Ellison, the Koch Brothers, Michael Bloomberg, Steve Jobs (now deceased), the Walton family descendants of Wal-Mart and, again, a handful of others who are largely known for their role in the age of computers, the Internet, telecommunications and electronic devices. And don’t forget to read Charlotte Iserbyt’s revealing and TRUE work, loaded with documents and footnotes, The Deliberate Dumbing Down of America. It helps to explain why you don’t know this stuff, why the reins of power have been stolen from us, and why things are not soon going to get better.